This industrial label printer fulfils high demands on hardware as well as enormous requirements for the quality of the produced media. Along with the intelligent features of the device, the robust construction for long-term applications is a decisive advantage. This is supported by easy handling and a system for managing consumables designed for long-lasting and uninterrupted operation that sets an absolute benchmark. 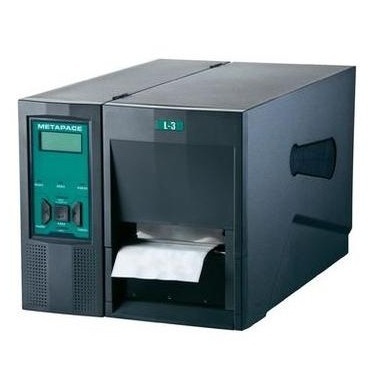 As the flagship of the label printer family from Metapace, the midrange label printer L-3 guarantees all these characteristics and tackles even difficult requirements with flying colours. As a professional printing device for medium to large volumes of labels, it is particularly predestined for production, warehouses, mail order, or logistics. Using direct thermal or thermal transfer printing, it creates up to 118 mm wide labels with high quality and quick production times. With 254 mm per second, labels and tags are produced quickly and furnished with bar codes, graphics as well as text, and then fed into the process chain. Along with the standard variants, you also get the L-3 either with 12 or 24 dots/mm 300 or 600 dpi the 4 MB Flash and 8 MB SDRAM memory, designed for complicated motives and intensive printing performance, ensure optimal performance to the last detail including for high resolution printing jobs. In terms of equipment, the L-3 also boasts the complete array of features accustomed from Metapace. Components such as a power cord, label roll, ink ribbon, USB interface cable, drivers and manual, and even label printing software full version are included as standard. Elements that you may miss from other manufacturers or that must be purchased at expensive prices are included and effortlessly expand the range of integration possibilities, while the free software allows users to become label professionals without being dependent on programmed interfaces. Through the user-friendly, Windows-like user interface, it is easy to get accustomed to the software, allowing large volumes of personalised labels to be quickly produced with database connections and diverse additional tools. The easy operation and configuration of the hardware is also fool-proof, which is ensured through the simple user guidance via the large LCD display. The large steel housing professionally accommodates diverse media, which are easily and accurately processed through Black-Mark and transmissive sensors. Exchanging consumables is reduced to a minimum, as the supply of up to 203 mm large label rolls and up to 600 m long ink ribbons makes user access seldom necessary. With its large range of applications and connection options, the L-3 increases the productivity of each application while avoiding additional costs a manual peeler and multi-interface parallel, RS232, keyboard wedge, and USB are included on board as standard the device can also be subsequently upgraded with a cutter as well as Ethernet and Wi-Fi. The integrator need not worry about compatibility, as Windows and Opos drivers for NT, 2000, 2003, XP, Vista and 7, for both 32 and 64 bit are included in delivery. In addition, communication is very smooth the L-3 automatically recognises ZPL and EPL and adjusts itself to the respective requirements. The compact housing and the dark colours make the L-3 less susceptible to dirt, making it the ideal device even in tough industrial environments. The stable metal housing is long-lasting and nevertheless exceptionally light, so that it can adjust itself to conditions of changing surroundings or requirements, also over the long-term.